The Internet of Things (IoT), is a tech trend that has no indication of slowing down when we look ahead to the future. In fact, researchers estimate that IoT spending will rise from $656 billion in 2014 to $1.7 trillion in 2020. Businesses already leveraging IoT are gathering valuable insights and easing processes by inserting devices inside physical objects. What makes IoT so unique is its ability to help businesses in every and any industry. Let’s take a look at three different enterprises in three completely different industries and how they successfully used IoT innovation to improve their business. This company brews crafts beers that are available to consumers in the Midwest area. They brew a variety of craft beers at their location, each with a specific range of temperatures the brew needs to stay within. Currently, the brew-master must monitor the temperature manually, but brewing a quality beer can take more than a week. The brew-master was in desperate need for an automated way of capturing and measuring temperature information of each brew, while providing alerts if the temperature was outside the specific range. The first step in the solution was to implement end-to-end hardware and software. A 3D printer was used to create an enclosure that houses a device for capturing the temperature of the brew from within the equipment. A process was built to pull the data from the device, every 10 seconds. A dashboard was created that displayed the temperature data against the temperature range and showed when the brew was approaching the upper or lower boundaries. Alert! To finish it off, a big data solution was incorporated to analyze the temperature historically for comparison purposes. Real-time monitoring and reporting of each brew’s temperature every 10 seconds drastically reduced the manual effort of the brew-master. Proactive alerts of temperature variations also helped the brew-master rest easy at night. This company manufactures a set of tools that are used by both professionals and consumers. Many of the tools capture usage metrics that are stored directly on the tool. Their current mobile application communicates the metrics to the client, which are then loaded into Excel for analysis. This process was labor intensive for the client and did not provide a mechanism to compare metrics across all tools of the same type. What they needed was a single point of storage for all metrics that could be analyzed by their engineering group. 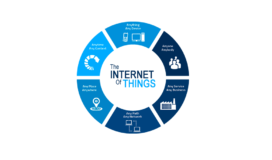 The IoT solution began by enhancing their existing mobile application to communicate usage metrics directly. Stream Analytics were then used to capture the metrics, parse the data from the device, and store the individual metrics in the cloud. This started a process for creating historical information for each tool, by comparing the last time the tools were synced with the current set of metrics. Lastly, a new unique portal displayed each of the tools metrics along with various graphs and visuals that compared all similar tools. This enterprise provides a service to track assets for its customers. They manufacture a set of tags that are affixed to any type of asset that the customer wishes to be tracked. The typical use case is a shipping yard that has various types of containers that need to be easily monitored before shipping. Similar to the microbrewery solution, the first step was implementing end-to-end hardware and software. Then, Android and iOS native applications were built, followed by a customized field/cloud gateway for communication. Websites were created to provide access to customers and the logistics company to manage the setup and monitoring process. The solution wouldn’t be complete without an alert and notification system for issues related to monitored assets. Customers were able to find and track assets via mapping on mobile devices and the web. Monitoring the asset movement within the yard and personal alerts about assets leaving the area helped customers feel more secure about their assets being shipped. Although these three companies have unique business models and industries, they were all able to use IoT solutions to augment their business. With IoT projected to be a trillion-dollar industry in the next four years, it is no secret that businesses in every market will be brainstorming how they can incorporate IoT to gain a competitive edge. How will your business or industry utilize IoT in the near future?